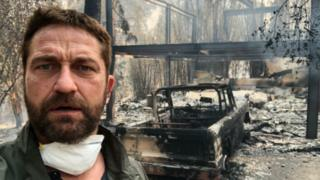 Scottish actor Gerard Butler has told how he was forced to flee his Malibu home to avoid the Californian wildfires. The Hollywood star was among thousands of people evacuated as blazes spread across the state last week. The Paisley-born actor returned to his home on Sunday and tweeted a picture of its burned-out shell. He said: "Heartbreaking time. Inspired as ever by the courage, spirit and sacrifice of firefighters."